I chuckle a little to myself as I post and look back over the month so far. I feel like I must have some kind of crafting attention disorder. Perhaps if I stuck to one thing, I might get really good at it. But what fun would that be :) I really like learning how to do different things. Over the past lots of years I have taken short workshops in applique, tin punching, throwing pots, tatting, oil paints, stained glass, scrapbooking, drawing (totally stressful)...I have tried simple jewelry making, I love counted cross-stitch, sewing, faux painting on my walls, small table fountain making, wood crafts and I have reupholstered a few pieces of furniture (I learned that from watching my grandparents). For my 40th birthday, my dad gave me a scroll saw. Trying all these things are so fun, and I am excited to have found new things to try while visiting other participants sites during AEDM. What kinds of things do you like to do besides what you have posted this month? 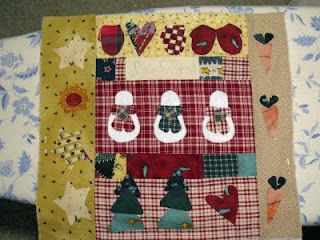 I have been working on and putting away this applique/quilt top for awhile. It is from the company Calico Station and is called "Winter Stew". I have gotten it back out and now I am ready to stitch the wording (Be Warm) and give details to the snowmen. Then stitch around everthing else. Maybe I will actually have it done for this Christmas! You make me laugh!! I think wanting to do one of everything comes with the artistic territory. 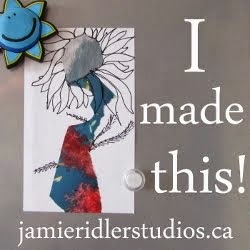 I love the applique-I bet it will be so amazing when finished. Your dad gave you a scroll saw for your birthday? Now that's a cool present! !